Many groups of people have someone that can be viewed as the lovable oaf. While their flaws are undeniable, they are kept around because their intensions are good and they try their best. 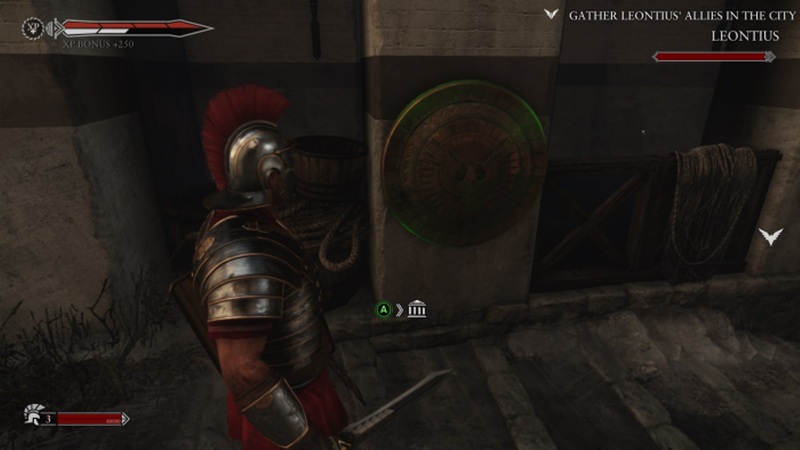 Ryse comes off as that lovable oaf for the gaming community. Not perfect but fun. After a brief tutorial, the story is told as a flashback of the events leading up to the current invasion of Rome through the eyes of our protagonist Marius. Upon completing his training to become a soldier, he is granted a short stay at home before being shipped off for duty. During this visit there is a barbarian invasion that leads to the death of his family and sets his vengeance storyline in motion. No, it’s not a spoiler…it’s the first level. This is not a long game, barely breaking double digits in hours, so there are not a lot of opportunities to veer off course with the narrative. In the end this benefits the game greatly and actually makes the story one of the highlights. Yes, it does start off slow but by keeping it simple and limiting the number of twists or absurd developments there is a very pure anticipation of how the events will unfold by the time the final chapters are reached. 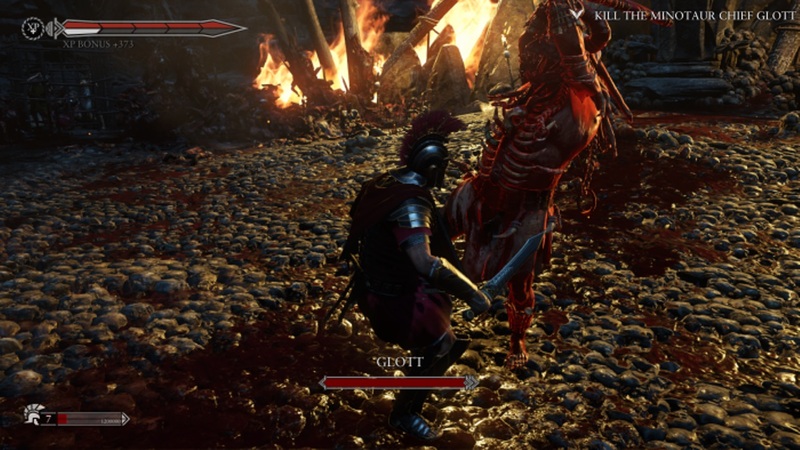 Combat is fun, approachable and incredibly easy to just pick up and play. Attacks always seem to carry the right amount of weight and impact while the feedback from the gore makes one feel like a master in the art of killing. If there is one complaint I would have it is that strategy in battle boils down to a rock paper scissors formula. You have an attack, a shield break and a parry. Of course it is more varied than a mindless hack and slash but a lot of the time I found myself just circling the enemies waiting for a combat cue to tell me which attack to use. This would often lead to a bit of a stalling feeling in what would normally be a high intensity encounter. Let’s talk about those encounters. There will always be 2-3 enemies around you. No matter how many are in the background fighting your NPC companions they will filter in replacing downed enemies until there are no more. This makes it really difficult to gauge how long you will be in one area fighting waves of enemies until you can move on. Also, there is minimal variety to the enemy types. Expect to see the same normal, heavy and big barbarians from start to finish. There are a couple of deviations but they are mostly relegated to set pieces or boss fights. These end of level duels are just tedious. When they begin they seem a bit more unique from the run of the mill combat but eventually just become way too drawn out with much smaller margins of error in your rock paper scissor abilities. At the very least these fights are usually with the more charismatic or story related characters which add more appeal to the outcomes. Not too much depth but still decently engaging. 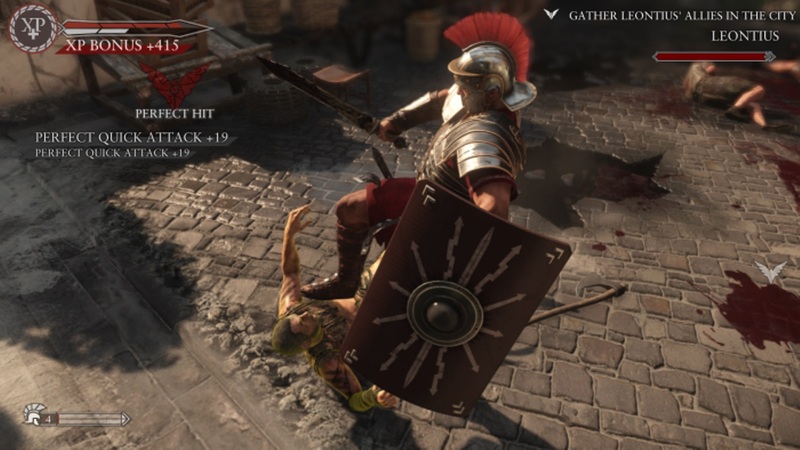 There are a couple of different set pieces to break up the combat such as mounting a stationary crossbow to take out waves of enemies or pushing a battle line forward with a group of soldiers creating a shield wall but these are limited in scope and not utilized more than a few times. They are enough to give a brief change of pace but not enough to really classify as a big variety. It’s clear the developers held their execution system in high regard, probably hoping the juvenile side of us gamers would be so happy with the blood and gore that we would not require additional variety or upgrades. Yes there are upgrades but they don’t add new attacks or combos. They will increase experience gains, focus and carrying capacity and of course additional executions. Their effectiveness isn’t altered, just the visuals of the gore and a different quick time effect for the kill. A final note that I need to make about the upgrades is that they can be purchased with currency gained in game or by busting out your credit card and purchasing them. Don’t do that. It’s the biggest piss off in the game and the developers should not profit from paid shortcuts. They aren’t even that difficult or time consuming to obtain by just playing the game. Back to the executions that could be purchased, they are all quick time events. We all know how beloved those are within the industry. Even still you will continue to rely on them because they are guaranteed to finish off the opponent and can be used to recover health, focus or gain an increase to experience or damage dealt. If you are concerned about missing your queues in the quick time events, don’t be. The game will hold your hand by highlighting the target in the color corresponding to the button that must be pressed. In fact that goes beyond the executions with collectibles in the world are highlighter with a green glow and gates or wagons that you can interact with bathing in yellow. So while your reaction time might be poor you will never be confused with what you should be pressing. Quick note on the collectibles, unlocking the pages to a graphic novel that can be read in the menu is must more motivating than just an arbitrary number for completion. Good work on that part. I want to close this all off by talking about the graphics, they are gorgeous. All of the talk about the game being disappointing because it was only in 900P is confusing to me. Rather than focusing on the lower resolution, credit should have been given to what they did with it. If the argument was that the faces were poorly animated and took away from the overall visual appeal, yeah that’s true but the environments and character models really popped. Heck, even the slow panning load screens carried so much style that I didn’t mind them near as much as I do most load screens. It might sound like I am being overly critical of the game but I have to reassure everyone that I had a fun time playing it. Flaws are there but that doesn’t mean that they ruin the experience. Hopefully they are just taken as pointers to improve the inevitable sequel. 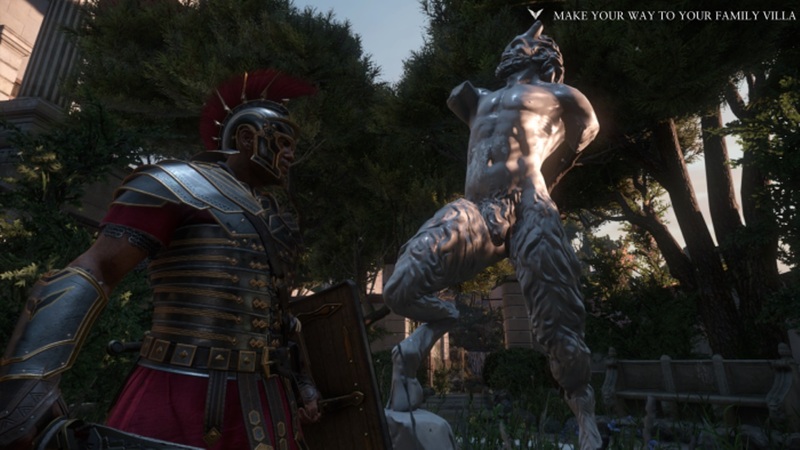 Ryse never struck me as a launch title that would move consoles but now available in discount bins it is well worth a playthrough.